Neighbors have cats. Several outdoor cats. Neighbors do not a) provide an outdoor sandbox or desirable place for cats to ‘go’ and b) don’t bring their cats in at night, even when temps dip below freezing. 1) Our beautiful landscaped yard and outdoor dining area reeks of cat urine and feces. My husband removes a quart of feces a week from the soil. Sitting in the yard and having outdoor meals during this beautiful/warm summer is made unpleasant by the stench. Gardening has become a stinky land-mine event. 2) The cats overnight on our porches.The cats sleep in the daytime under our plants in the yard. My husband is highly allergic to cats so having them sleep on our doormats poses a significant health risk to him. I’ve asked the neighbors to provide an outdoor sandbox for their cats in their yard and to bring their cats in at night, and explained why. How did that work for us? Complete disinterest in the negative impact they create in general on their neighbors by having outdoor cats and complete disregard personally to us (literally 10 feet way [how far our homes are apart]), i.e., zero attempts to address the problems. Wow. 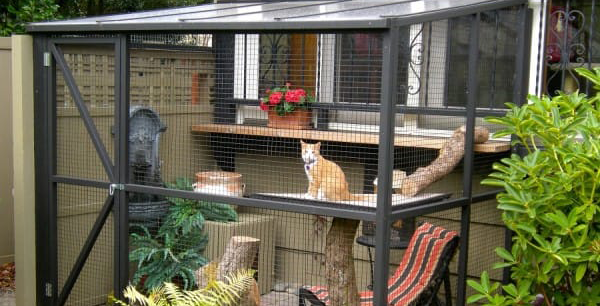 A simple and great solution to protect both cats and neighbors! Cat owners CAN be responsible, just like dog owners are expected and required to be. They can contain their cats, allow them outdoors and prevent the substantive and negative externalities on neighbors! Another upside is outdoor cats would no longer decimate the bird population. Please gawd let Catios become a trend in Alameda. Why is it, anyway, that owning a cat doesn’t come with expectations and requirements to be responsible for the cat? Why is it different than owning a dog or a bird? I’m tolerant (up to the point where people are taking advantage) and I’m an animal lover. I’ve even trained one of the neighbor’s cats, who is particularly lonely [needy for attention] and who we’ve found snuck into our home on more than one occasion, to sit-stay on the porch at the doorway and not enter our house when our door is open on warm days when we are coming/going to the yard. But no matter which type of domesticated animal we choose to have in our homes, our responsibilities should be the same: to meet the animals’ needs and care in a manner that also does not have an egregiously negative impact others. In his June 11 commentary in the Alameda Sun, John Knox White, a city Planning Board member, attempts to defend that the analysis for the environmental impact report for Alameda Point’s 1,425 homes and 9,000 jobs will result in net-one-car-off-Island during the morning commute. His long-overdue admission that the report did rely on one net car off-Island during the morning commute is followed by a preposterous attempt to explain why concluding that a massive project like Alameda Point would produce only “one (additional) car off the island” and “isn’t as crazy as it sounds.” His belief is that Alameda residents who leave the Island will no longer do so because they will instead go to the new jobs created at Alameda Point. It is every bit as crazy as it sounds. “One-net-car” is the canary in the coal mine, but there is much more wrong with this environmental impact report. Its calculations are based on assumptions that are pure fantasy. And using them produced these erroneous results. The most surprising of all was the report concludes there will be no congestion at the West End now or after all is built. That’s right, vitally important and totally unbelievable. To wit: The environmental impact report’s traffic analysis assumed a total of 5,400 new homes on the Island, including 1,200 new homes at Alameda Point, and 20,000 new jobs citywide, including 8,000 new jobs at Alameda Point. To believe Alameda will generate 20,000 new jobs over the next 20 years, one must put blind faith in a whopping 66 percent increase in jobs, from 30,000 today to 50,000 in 2035. That kind of job growth just isn’t going to happen! An increase of 8,000 citywide over the next 20 years is unrealistic for an Island city like Alameda. But an increase of 20,000 more jobs is delusional. This high job assumption skewed the calculations significantly and reduced the estimated traffic leaving the Island from both the Alameda Point project and the 4,200 other homes planned outside the Point. These errors were compounded by a non-professional like White to take it one step further. He adds his layman’s opinion to back into the report’s conclusions of one net car off-Island due to Alameda Point project during the morning commute and no change in traffic delay at the West End now or after all is built. The people of Alameda are not anti-development, and neither am I. We just want development to be reasonable, well-considered, and based in reality. The Alameda Point environmental impact report’s citywide traffic results including White’s commentary are not reality-based; they are a trip down the rabbit hole. Yes, the homes will be built. There is high demand for housing. Site A, the first project at Alameda Point, is primarily housing, with 800 units. And it is possible 5,400 homes can be built citywide as staff claims. The new zoning approved by the previous City Council allows for it. We want to say yes to developers, too, but only when realistic data such as realistic commercial and housing development goals have been obtained and only if it will lead to good planning, reliable engineering, and fiscal neutrality (i.e. the base infrastructure not costing taxpayers in general). Where Alameda Point and all the other projects are concerned, the people just want to know: How bad will the traffic be? How long it will take to get off the Island? Instead of the simple truth, we’re getting ridiculous claims of 8,000 jobs on the base and 20,000 citywide jobs, and city zoning allowing 5,400 more homes – ignoring the voice of the people when they voted down the SunCal plan. Alamedans are being asked to believe the projection of zero morning outbound traffic at the Island gateways due to the Alameda Point project; no traffic congestion at the West End, now or after all is built; and the vast majority of us living encapsulated lives where we never leave the Island. It is not just crazy, it is insulting. I urge Alamedans to speak up. The council must carefully scrutinize staff reports to ensure the veracity and reasonableness of all information they contain. Doing less may result in far worse repercussions. This environmental impact report’s citywide traffic study is flawed and should not be reused repeatedly to approve rezoning and new housing applications, as it has been. Eugenie P. Thomson, P.E., is a retired licensed civil and traffic engineer and a longtime resident of Alameda and has volunteered on community projects. Alameda City Planner Andrew Thomas’ May 1 letter to the editor of the Alameda Sun is disingenuous and borders on ludicrous. In a carefully worded statement, Mr. Thomas states that the city council, planning board, and Alameda Point Environmental Impact Report (EIR) “did not say” at multiple public hearings “that the redevelopment of Alameda Point would result in only one car.” Far from producing the “Oh, okay then!” reaction he undoubtedly wanted, this declaration simply begs the question: Why not? The Alameda Point EIR is a fantasy. Page 4C-92 by the year 2035, Cumulative Project Conditions states the project’s impact is “insignificant” at the Webster and Posey Tubes. Table 2-2, the summary table of the project impacts indicates “no traffic impacts” due to the project at the west end of the island approaching the Posey tube during the morning commute. Furthermore, tables 4.C-2 and Tables 4.C-15 in the EIR, with the exception of the intersection Challenger Drive and Atlantic Avenue, all intersections in the west end of the island, had no significant delays during the morning commute today nor in the future year 2035 with Alameda Point and with all the homes proposed in the Northern Waterfront. How is this possible? Really? Thomas professes that Alameda Point will bring 9,000 jobs, attract $600 million in private investment to support job and business growth, and support the existing business and residents at Alameda Point. But how in the world can Alameda support such growth at Alameda Point and the growth in the Northern Waterfront area, if the people cannot get from point A to point B? Common sense dictates that, before we bring development of that scale to our island, we must first be certain we can accommodate the growth. Mobility is the first and foremost criteria in making that judgment. A major influx of businesses and people will do nothing but exacerbate already untenable traffic conditions on the island. The EIR, city council’s actions, and Mr. Thomas letter were all written with one goal in mind—to ensure the development and real estate communities would go along with the Alameda Point and Northern Waterfront projects and its findings in the EIR. The people’s well-being was secondary, and the facts were twisted to tamp down public dissent. Still, the city refuses to focus on the truth that traffic will be beyond overwhelming if all the development projects take place. But that’s not the most alarming part of what is happening here. The Alameda Point EIR’s traffic data was used for the Del Monte Project and is being used for several other new development applications. The city simply modified the Alameda Point EIR’s traffic volume data for a few intersections near the proposed development sites and then accepted all the other findings in the EIR regarding cumulative growth. The traffic study in this EIR is fatally flawed and should not be used as the basis for approving even one project, much less multiple developments. Don’t be misled by Mr. Thomas. The Alameda Point EIR’s traffic evaluations indisputably result in the conclusion of one net car off-island during the morning commute as a result of the redevelopment of Alameda Point. They constitute nothing more than a fairy tale. Alameda needs an honest, realistic traffic study of the predicted cumulative development, with reasonable assumptions regarding growth in jobs and housing, in order to realistically plan for the island’s future. An old saying comes to mind: “Fool me once, shame on you; fool me twice, shame on me.” Shame on Andrew Thomas for trying to pull the wool over the eyes of the people of Alameda in order to push through the Alameda Point redevelopment and Northern Waterfront projects, despite the fact that it clearly is inappropriate for the island and will throw us into a traffic gridlock that will make all our lives miserable. Shame on us if we let him get away with it. Eugenie P. Thomson PE is a licensed civil and traffic engineer, retired, and a long-time resident of Alameda. The Traffic facts and Figures cited above are available on the website of the Alameda Sun. Dangerous substandard designs for our roadways? Streets throughout California are being rebuilt to accommodate the increasing number of bicycles on the road. Due to narrow rights-of-way and the implementation of separate bicycle paths within preexisting roadway cross-sections, this process involves completely redesigning roadways. I applaud the efforts to make the roads safer for all users but alarmingly, less-than-minimum safety design standards are being applied. This practice is counter to the needs and desires of the public and it is happening here in Alameda. The City of Alameda has been approving design concepts for these roadway reconstruction projects that violate minimum design criteria and with experimental designs (i.e. Shoreline Bikeway), followed swiftly by approval of grant applications for their final engineering and construction. The Clement Avenue and Central Avenue Complete Street Plans are moving in the same direction. Problematically, the City has no qualified civil engineers in responsible charge of these projects. All of the City’s four lead civil engineers have left. Clearly numerous safety and traffic delay problems are going unresolved. Would you hire a divorce attorney who is not licensed? Would you hire an obstetrician who is not licensed? Of course not. Nor should Alameda hire planners to perform civil engineering functions who are not licensed or qualified in that field. But that is exactly what is happening. I am very concerned that the City is moving forward with reconstruction of its streets with numerous safety problems and causing nightmarish congestion by what staff calls a road diet. (i.e. reduction of lanes). The same cycle path on Shoreline Drive was recently approved by Public Works staff and consultants to be built on the estuary side of Clement Avenue between Grand and Broadway. The city and consultant’s staff, all planners, stated there were no major flaws. This was concerning, in and of itself. But little did they know that their design was particularly dangerous. Neither the drivers nor the bicyclists would have had adequate stopping sight distances to stop safely (i.e. blind corners) and there were numerous violations of even the most minimum safety design criteria. Further their design with only one lane (11 feet wide) in each direction required a complete shutdown of Clement Avenue for the regular wide deliveries to the marinas. Their design also added an extra signal phase just for bicycles which would have required a reduction in signal time for autos at Park Street- severely increasing delay for all Alamedans leaving the island in the morning through the Park Street/ Clement Avenue intersection. There was no mention whatsoever anywhere of this excessive increase in delay. Were they hoping Alamedans would not pay attention? Residents and business owners went to the Transportation Commission on March 25th to fight for what was right. It is heartening the Transportation Commission turned down the City staff and consultant’s plan but with only a slim majority. Wouldn’t you agree Alamedans should not have to go to City Hall and tell staff and consultants that their work has major flaws and the plan is biased and unsafe? Traffic safety issues are going unaddressed. Let me explain from personal experience. About 15 years ago, my Mom then in her early eighties, was hit by a bicyclist in a similar configuration as along Shoreline. She stepped out of the passenger side of the car into the path of bicyclist traveling quickly. Bicycles easily travel east along the new Shoreline path at 20 mph or much more with the usual tail wind. This too is in the same space where young children excitedly exit the cars to go to the beach. Building a “commuter cycle” track on Shoreline was inappropriate and unsafe for a recreational trail along a beach. It is a commuter bicycle concept to save time not meant for recreation. A recreational trail should have been built like the one at Crissy Field or like those in Holland along beaches. I beseech Alamedans to speak up to Council before these poorly designed roadway plans for Shoreline, Central and Clement Avenues cause serious injury. As I think you will agree, these roadway changes affect virtually every Alamedan. We applaud the efforts to make our roads safer. However, far greater care must be taken in keeping us safe. Roads must be designed by qualified civil engineers as required by State Law. As members of our city leadership, I would like to ask if the concept of “maximum capacity” is a part of your decision making process when considering the numerous, high density development projects that are either underway or close to being underway all across our island? I recognize the need to allow for incremental growth and “do our part” to address the ever increasing population of the Bay Area, but the current rate of growth currently planned for our island far exceeds what is required by the Association of Bay Area Governments. In their current projected plan to address population increases over the next 8 years, the City of Alameda is only required to increase our population by a total of 1, 723 persons which you can see very clearly in Appendix C of their Regional Housing Need Plan for the San Francisco Bay Area: 2014‐2022. Yet we are potentially going to be meeting this increase requirement with just one of the projected planned projects! With this in mind, I know we have room for development, but unlike most other bay area cities, our unique geographic circumstances lead me to believe that we have already exceeded safe levels of maximum capacity that is a required safety measure for all confined spaces. Particularly for central and western Alameda, where all residents primarily use an aging tube to vacate, this is of extreme concern. I would request that we start remembering that we live on an island, a confined space, which requires some measure of discussion about what our ultimate limits and abilities to accommodate truly are. The argument that we “already don’t have enough egress off of the island to safely address the needs of the current population in the event of a major catastrophic event, so why should it matter if we add more?” doesn’t sit well with me. If ABAG recognizes that incremental growth, 1,723 additional persons over 8 years, is sufficient to the needs of the bay area, why the hurry to build, build build? How are you prepared to address the traffic and parking congestion that is taking place across our city now, let alone after these multiple density housing projects are finished? You say you want to encourage a “green” city by reducing the ability (or desire) to have a single occupancy vehicle (car) yet I, as an avid cyclist, walker, scooter-er don’t see this city doing anything tangible to reduce car dependence. Where are our 0 pollution days? Our commute to work days? Our bike to the grocery days? Come on city leaders, we need more action and less talk. There are ways around Measure A and the state of CA has required affordable housing to be built through laws such as the Density Bonus Law. Some community governments attempt to resist the stat’s mandate and some use the mandate to push through development. Affordable housing is for low low (not a typo) income, low income and moderate income. • Get more info to be more methodical in thoughts. • Note “plants” in the audience, read the room.